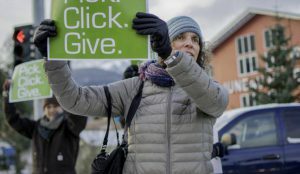 Juneau nonprofits rally for Pick.Click.Give donations | Pick.Click.Give. 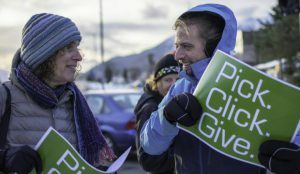 Making people aware of a simple charitable donation brought out a group of sign-holders braving the early-morning wind encouraging people to “Pick.Click.Give” at the Douglas Bridge stoplight Thursday morning. The Alaskan Community Foundation, in partnership with several Juneau nonprofits, hosted the rally as a way to raise awareness of PCG. PCG encourages Alaskans to support charities by donating a portion of their Permanent Fund Dividend. The rally is in its second year throughout the state, but this is the first time it is happening in Juneau. Tristan Knutson-Lombardo, Executive Director at Southeast Alaska Independent Living and a participant on the statewide committee for PCG, explained this is a key time of the year for the rally to happen. “The busiest times of the year for people to file for their PFD are the first two weeks of January and the first two weeks of March because March is the last month to file,” he said. The program has grown over the years, with 2015 being the biggest year to date as 33,421 people contributed $3,330,250. Last year, 26,128 people contributed $2,702,450, according to Sofia Fouquet of the Alaska Community Foundation. Last year, Alaskans pledged $2.5 million, but if everyone participated, it would grow substantially. Knutson-Lomabrdo said since PCG started in 2009, almost $18.9 million has been donated across the state and Juneau had $26,000 donated to locally-based nonprofits. SAIL received $9,450 last year and has received $64,753 total, according to the pickclickgive.org. Julie Hamilton, treasurer on the board at Cancer Connection, said she understands that some people probably have an idea in mind with what to do with their PFD, but expressed that even if people contribute a little, it will help. Cancer Connection received $5, 075 last year and $51,800 total through the program. “People have thought out what they are going to do with their PFD check,” Hamilton said. “They may not want to take a piece out of that pie, but even if they donate $25, it really adds up. Mandy Cole, of AWARE, said she came out to the rally because she wanted to express how important it is to help the community nonprofits. AWARE received $20,983 last year and has received $165,803.37 total, according to the pickclickgive.org. The morning rally was the first of three PCG events held in Juneau Thursday. There was also a group photo at the State Capitol which included Juneau PCG nonprofits and supporters. Another rally occurred at the Douglas Bridge intersection between 4:15-5 p.m.